How to Pick Wheel Bearings? Bear These Tips in Mind. A guide to Hamilton's wheel bearings, listed in order of popularity. Our most popular bearings are best suited for applications that require rolling ease, but where side thrust isn't a critical factor. Pre-lubricated and sealed at the factory, they reduce maintenance costs because greasing isn't needed. Double-sealed precision ball bearings feature steel-reinforced rubber seals securely fastened to a groove on the ring of both sides of the bearing. Precision bearings now replace straight roller bearings in the majority of our wheels, and can be provided optionally on our other wheel types. Depending on the wheel type and application, we'll spec the 62 series precision ball bearings with a T-bushing, or a new precision flange-type ball bearing. These new one-piece bearings designed by Hamilton engineers work well for larger wheels. These bearings prevent rust and improve rollability in our stainless steel and solid urethane wheels. Can be custom spec'd in various sizes and configurations – including flanged, sealed square bores, extended inner raceways, and wide inner raceways with self-locking collars. Recommended for heavy duty and power-towed applications, tapered bearings handle the most severe downward and side forces. Used in various wheels and swivel assemblies, they come in pairs – one on each hub side. Each consists of a cup (hardened and ground outer raceway) and cone (roller assembly). They extend overall wheel hub length by about ¼ of an inch. Available with most casters and wheels that offer 3/4", 1" or 1-1/4" tapered bearings. Commonly features a snap-on steel case with a rubber lip securely clamped between the cone back face and shaft shoulder. The lip prevents dirt and debris from entering the bearing cavity (suffix –DS). For certain 1w" and larger tapered bearings, Hamilton provides a rubber seal and space (suffix –CRS). Traditional anti-friction bearing for industrial equipment. Features a cage-type roller assembly. Outer raceway may be separated or integrated. For environments detrimental to metal bearings, acetyl resin bearings offer chemical and corrosion resistance. Delrin® is standard in certain wheels, as either a sleeve or flange type bearing. Plastic bearings can be custom machined and installed in most other Hamilton wheels. Note: flange type bearings extend actual hub length of wheel by about 3/16 of an inch. While standard bearings can handle most applications, some jobs may require bearings with special features, or a custom-engineered solution. For example, alloy bronze and ferrous alloy bearings withstand high heat. Teflon®-impregnated bronze bearings are self lubricating and roll in harsh environments. Roller clutch bearings allow a wheel to roll in only one direction and square bearings allow wheels to roll on a square shaft. Have an unusual or extreme application? Talk to a Hamilton sales engineer, and we'll find a solution. 1 Chart is intended only as a general comparison, and not as a recommendation for any particular wheel in a specific application. Unusual conditions may require more detailed consultation with factory. 2 On smooth floors without obstructions. 3 Excluding marking or staining (depending on type floor). 4 Fahrenheit. 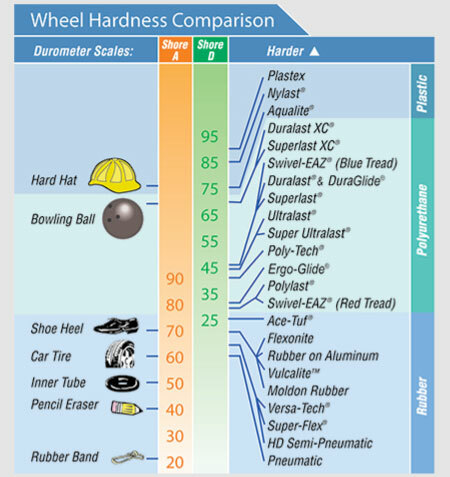 The ranges shown should be used only as a guide since wheel life, capacity and/or performance generally decline at elevated temperatures depending on length of exposure, etc. Not all bearing types will be suitable throughout the ranges given. 5 Steeltest Ductile Alloy or Forged Steel are available for higher impact resistance. 6 Extra-hard 90-durometer compound for higher capacity available on special order. 7 Neoprene oil-resistant compound should be specified for oily conditions. 8 Special high-temp compound available-consult factory.